Application Code : Code for internal use of ScriptCase. Should start by a letter. Connection : Connection name of the used by ScriptCase to access the tables. The user can select it. Default Profile : Default profile to be loaded into the production environment. Language : Data formatting based on the regional settings. 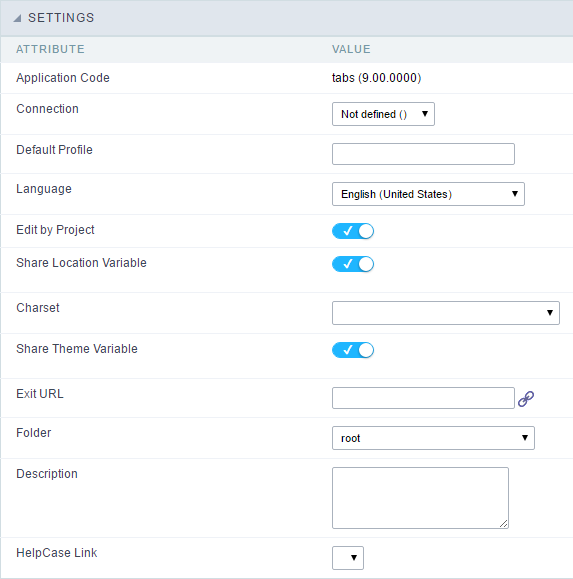 Charset : Share location with other applications based on the values in the session. Share Theme Variable : Shares themes with other applications based on the values in the session. Exit URL :URL to which the user will be redirected to exit the application. Folder : Folder where the application will be stored in the work group. The user can select it. HelpCase Link : Using this option you can associate HelpCase files to your application. This screen shows the global variables in the application. The global variable is an external parameter required for running the application. The application can include global variables in the WHERE clause, field definitions and names, event programming, and so on. if you need to use Database Identifiers in or tables, we recommend using the double quotation marks( “ ) instead of the brackets( [ ] ) because of the conflict with the Global Variables syntax of Scriptcase. Using the brackets as database identifiers may lead to problems in the Scriptcase applications. We do not recommend using session variables (global variables) with the same name as the table fields. In this case, the variable v_customerid appears in the global variables configuration. Attribute : name of the variable in the application. Session : In this option, the variable must be created as a PHP session variable by another application. GET : Defines that the variable must be passed by the URL, that is, visible by the browser. POST : Defines that the variable must be passed through the POST method of a HTML form. Settings : Does not validate (check) the variable at runtime. Type (In / Out) : Defines whether the variable is input or output. Description : Indicates where the variable is being used.